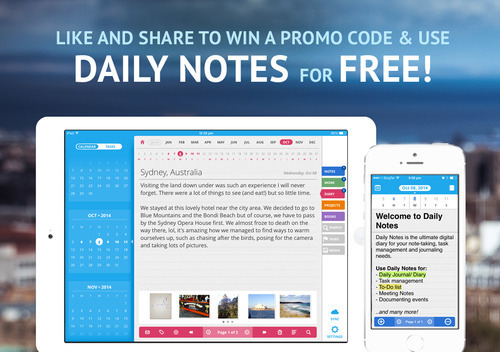 Win a promo code to use Daily Notes app for FREE! Like our Daily Notes Facebook page then “like” and “share” our Daily Notes promo code post. Follow us on Twitter @dailynotesapp and retweet our Daily Notes promo code post. Winners will be chosen randomly and will be announced via our Facebook & Twitter account. Start following, liking, sharing and retweeting those post now!